Take Highway 62 exit at Belleville. Go south on Highway 62 through Belleville to Dundas Street. Turn right, go past Tim Horton's to the next set of lights (Bay Bridge). Turn left. Go over the Bay Bridge ... you are now back on Highway 62 and in Prince Edward County. Continue south for approximately 15 minutes. Watch for the LOVE NEST STUDIO GALLERY sign next to the road indicating where to turn ... next right ... Wilson Road. 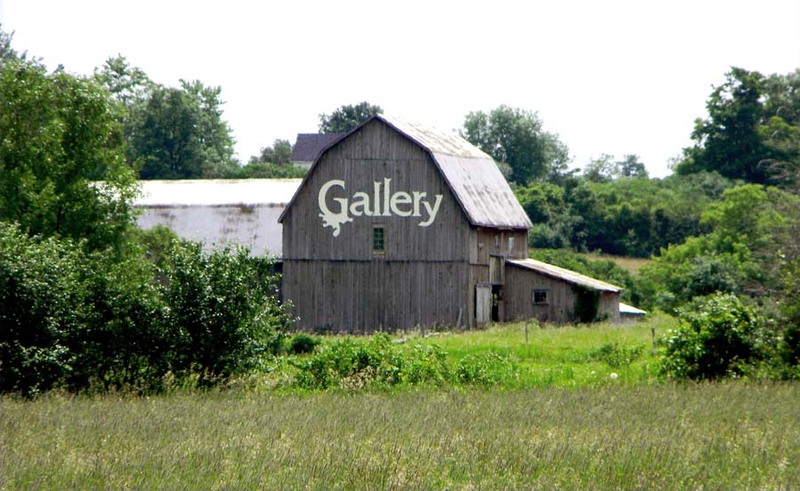 You can see the Barn Gallery from the road. If you have reached County Road #1, you have gone too far. Turn back and go north on Highway 62 to the next left ... WILSON ROAD. We are the fourth house (very yellow!) in on the north side. Take Highway 401 to Exit 522. At end of the ramp, turn right. Go south. At fork in road, turn right onto Highway 33. Continue south to County Road #1. Turn left onto County Road #1 (you will see Consecon water tower at this intersection on your right and the County Cafe on the southeast corner). Head east on County Road #1 for approx 16 KM. You will come to a 4-way stop at County Road #2. Continue east on County Road #1 another 4 KM. When you see orange silos on the right, watch carefully for WILSON ROAD sign approaching. Turn left onto Wilson Road. Follow to #54. We are a very yellow house on the north side of the road with an ARTS TRAIL sign out front on the drive way pillars.